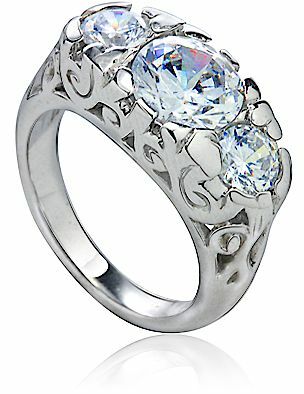 The Pemberly 2 Carat Three Stone Round Cubic Zirconia Antique Ring features a 2 carat round 8mm cubic zirconia center stone along with two 5/8 carat 5.5mm rounds set in a burnished, semi bezel setting. 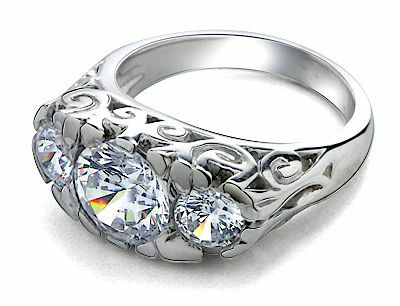 This Three Stone Round Cubic Zirconia Antique Ring features a beautiful antique style with extensive custom scrollwork. 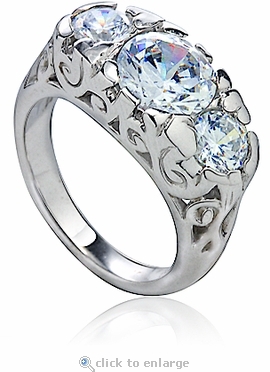 The Pemberly Three Stone Round Cubic Zirconia Antique Ring includes 3.25 carats in total carat weight of the finest hand cut and hand polished original Russian formula cubic zirconia and measures approximately 4.75mm in width. Choose from 14k yellow or white gold, 18k yellow or white gold and luxurious platinum. For further assistance, please contact us directly at 1-866-942-6663 or visit us via live chat and speak with a knowledgeable representative.